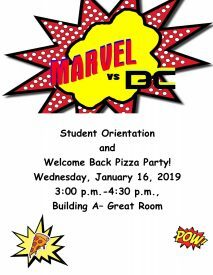 New and returning students are invited to attend Student Orientation and the Welcome Back Pizza Party on Wednesday, January 16, 2019 from 3:00-4:30 pm. The theme this year is Marvel comics vs. DC comics. This event will be held in the Great Room, located in Building A. Plan to attend this come-and-go event. Students will confirm their username and password for My.Mesalands.edu and meet with faculty and staff from the following departments: College Bookstore, Library, Student Affairs/Enrollment Office, Business Office, Mesalands Dinosaur Museum and Natural Sciences Laboratory, Math-Science Learning Center, Student Success Center, Mesalands Rodeo Team, Educational Services Center, Financial Aid, Fitness Center, and the Information Technology. For more information, please contact the Student Affairs Office at (575) 461-4413, ext. 189.